Home Blog It’s Your Mother’s Birthday! How Will You Celebrate the Nativity of Mary? Did you realize it’s your mother’s birthday today? That’s right. It’s September 8 – the Feast of the Nativity of the Blessed Virgin Mary. It’s the day on which the Roman Catholic Church celebrates Mary’s birthday. Your Mother’s birthday, and my Mother’s birthday as well. And what a Mother we have! “The greatness and dignity of this Blessed Virgin are such that God alone does, and can, comprehend it,” St. Bernardine once said. The Blessed Virgin of whom he speaks is Mary – the most excellent of God’s creatures. She’s not only the most excellent, but also she has the highest mission ever commended to any creature – to be the Mother of God! Mary occupies a unique place in the history of salvation. She was born to become the physical Mother of the Redeemer and the spiritual mother of all mankind. Although God could have chosen any means by which to redeem the world, he chose to have his Son become man through the body of a woman – Mary. Without Mary’s fiat – her free will consent to God’s request – his plan of salvation could not have been effected as he had foreseen. Mary is immaculate and full of grace and, through her, grace is given to men. Through her intercession and guidance, man becomes more like her Divine Son. Through her beauty and purity, all human nature is exalted. Mary’s is one of three birthdays the Church celebrates in the liturgical year. The other two are the Birth of Jesus (December 25) and the Birth of John the Baptist (June 24). That speaks to its importance (and her importance, as well, of course. If it’s one of just three, we’d better take note of it! In many parts of the world, September 8 is a day of thanksgiving and blessing of the summer harvest. In France, the winegrowers herald this day as “Our Lady of the Grape Harvest” and bring the best grapes to the local church to be blessed, attaching some bunches to the hands of the statue of Mary. New grapes also become part of the day’s festive meal. September 8 is “Drive-Down Day” in the Alps section of Austria, On this day, the cattle and sheep are led from their summer pastures in the slopes to their winter dwelling in the valleys as part of a large, festively decorated caravan. Also in parts of Austria, this day’s milk and all leftover food are given to the poor in honor of Mary’s birthday. Perhaps you aren’t a winegrower with a grape harvest to dedicate to Mary. Maybe you’re not a rancher or sheepherder who can “drive down” your animals to the valley along with a decorated caravan. But, you are capable of doing something festive in Mary’s honor. It might not be possible for you to give your extra food to the poor, but you could make a special monetary donation to charity. A decorated caravan would be awesome, but not many of us have one handy. Instead, what about a festive birthday meal? No grape harvest? 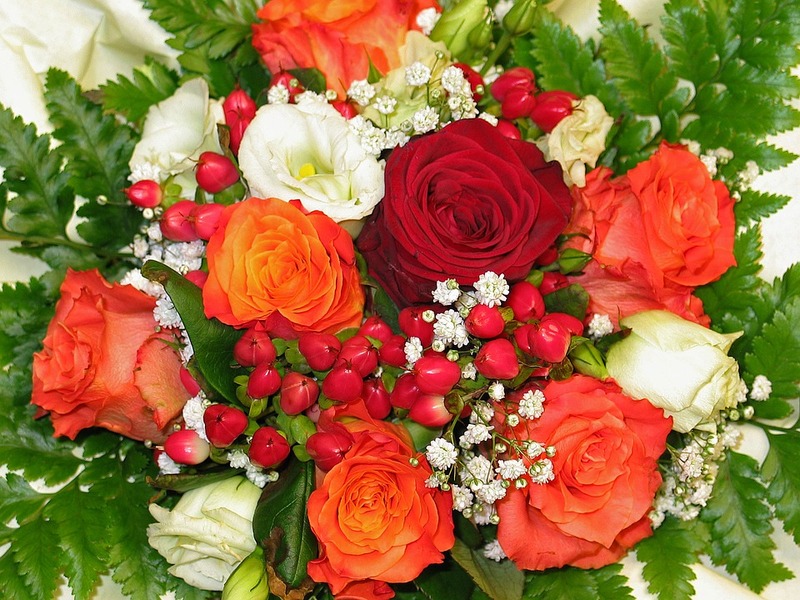 A lovely bouquet of flowers placed in your home or even brought to your parish church or local Marian shrine would be amazing! Humans are such tangible creatures. Celebrating our Mother’s birthday on the outside with physical actions and experiences will help us more fully celebrate her birthday on the inside. Otherwise it’s just a thought or a passing sentiment. Go ahead, wish the Blessed Mother happy birthday, as well you should. But then do something to celebrate it. The difference will astound you. After all, it’s your Mother’s birthday!